Daikon or ‘Big Root’ is a common name for a group of large (mostly) white radish plants. There is quite a bit of variation and they can look and taste subtly different but essentially all like a classic radish. They can be sued with fresh and cooked. When you cook them it tends to remove most of the crispy radish ‘bite’ flavour and leave them as tasting more like other succulent root vegetables – mostly like a mild turnip. They grow fairly fast and easily and best in cool weather and with lots of water and a deepish soil. 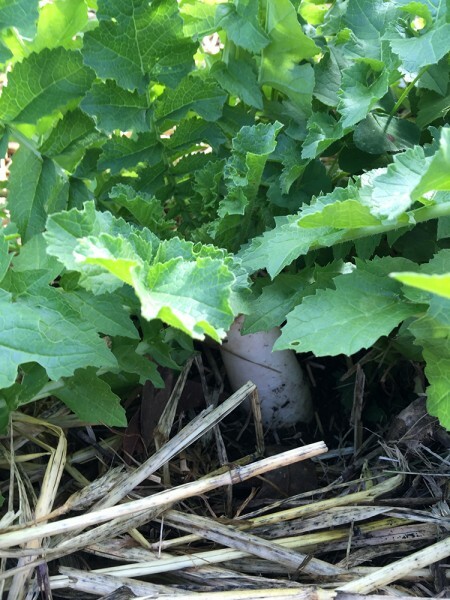 The radish will lift out of the ground as it plumps up before harvest. I find the summer to be generally difficult to grow them as they go to seed so early with any warm dry spells. The best harvest time for the main root is around mid to late winter (which here is around June-July). This is Minowase which is a classic good tasting and reliable open pollinated variety. You can see that a great amount of the root is actually out of the ground. I like to sow the seed and then build ip a good layer of mulch with straw as they grow larger. Because they tend to have a good deal of the root expanding out of the ground it;s good to keep the them protected from the weather so the skin stays nice and fresh and soft. You have to be careful of slugs and snails building up around he base if you do this but i find it works ok if you have good local bird population – also growing them into winter or cold weather makes the insect activity less of an issue. 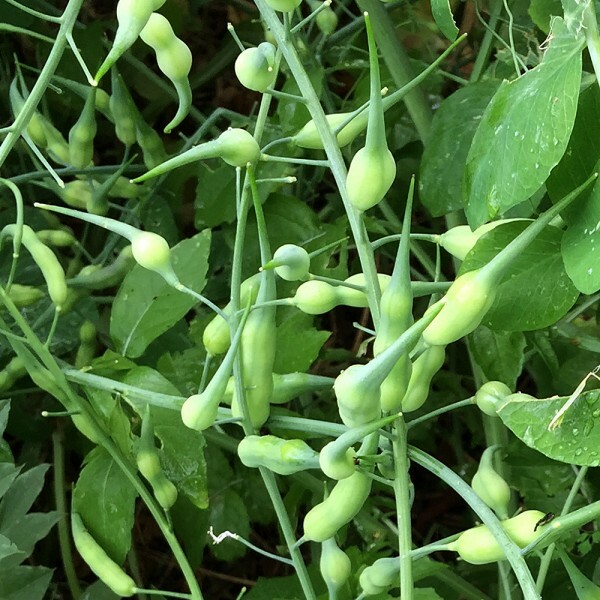 However they do provide a secondary crop in mid spring (around late September – October here) which is the large succulent seed pods which can be a tasty vegetable in their own right. And the flowers are quite nice too. The leaves can be eaten too as a general green vegetable if you don’t want to waste anything – they are not especially tasty on their own as they tend to have a bit of a tough texture unless grown very fast but they can go well in a mixed salad, stir fried vegetable dish or steamed by themselves with a little soy and garlic added. The roots pickle well too like the traditional turnips in Lebanese and Japanese cuisine. You can add a red dye like Beetroot juice or Shiso (like Uma-bosh plum and ginger) so they look like the classic pickled Ginger. 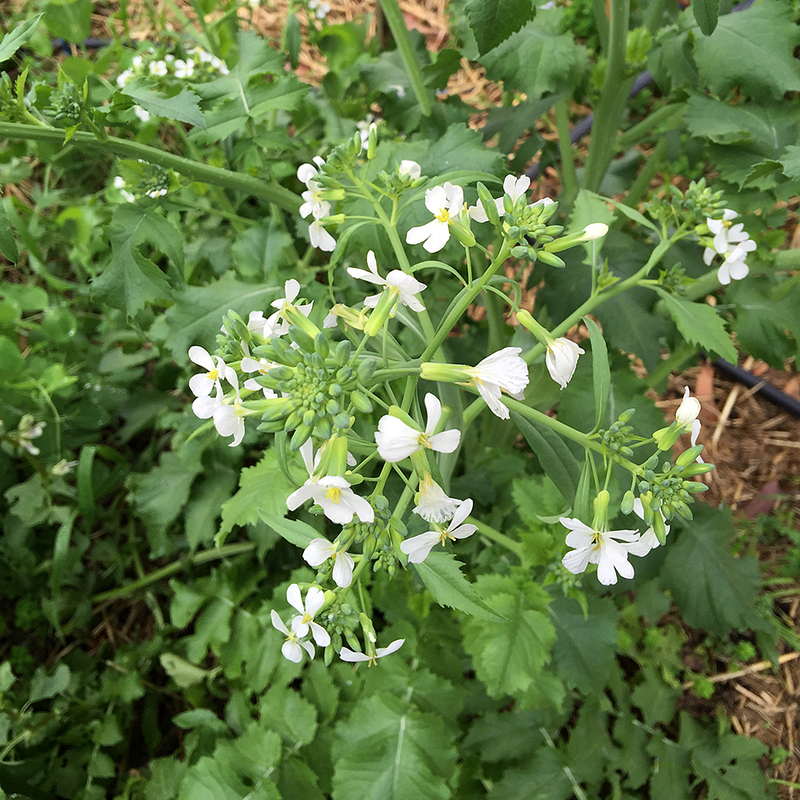 The varieties I mainly grow are the Japanese Minowase and the Northern Chinese Green Luobo Radish (Qingluobo). Both have good tasting reliable roots and seed pods. Daikon have various quite a few other common names such as ‘Mooli’ for which I am not sure of the origin. 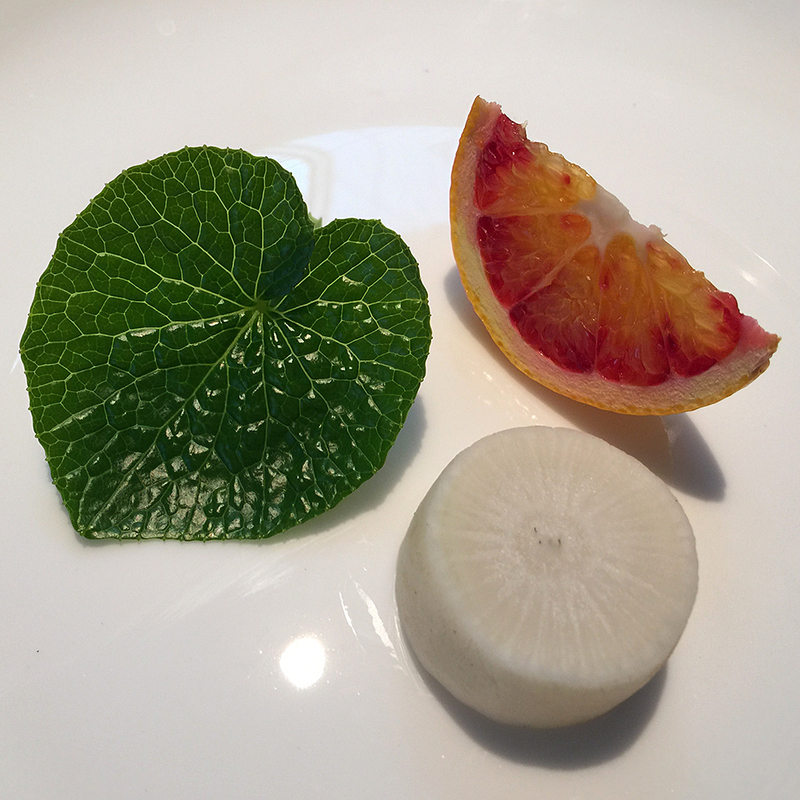 Here is a nice tasty ‘serving suggestion’ – A fresh wasabi leaf, a slice of Daikon Minowase and a slice of blood orange -all of which are in season at the same time.